After years of declining revenues and a total shut down as a result of an employee walkout. The Rutland Railway faded into the history books at the end of 1963. The Vermont Railway, Green Mountain Railroad, and Clarendon & Pittsford took over rail operations of much of the former Rutland Railway in Vermont as a result. The state of Vermont purchased the Burlington to Bennington segment from the Rutland estate, which became the new Vermont Railway in 1964. Also following in 1965 was the creation of the Green Mountain Railway on the Bellows Falls to Rutland segment. In 1972, marble-hauling shortline Clarendon & Pittsford was acquired by Vermont Railway and brought into the fold. 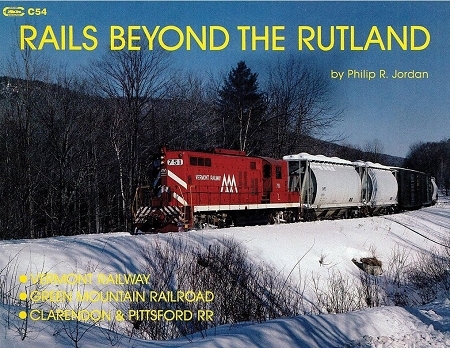 This book is a great historical review containing excellent equipment roster shots and detailed descriptions of early operations from the final days of the Rutland Railway right up to the mid-1980s.